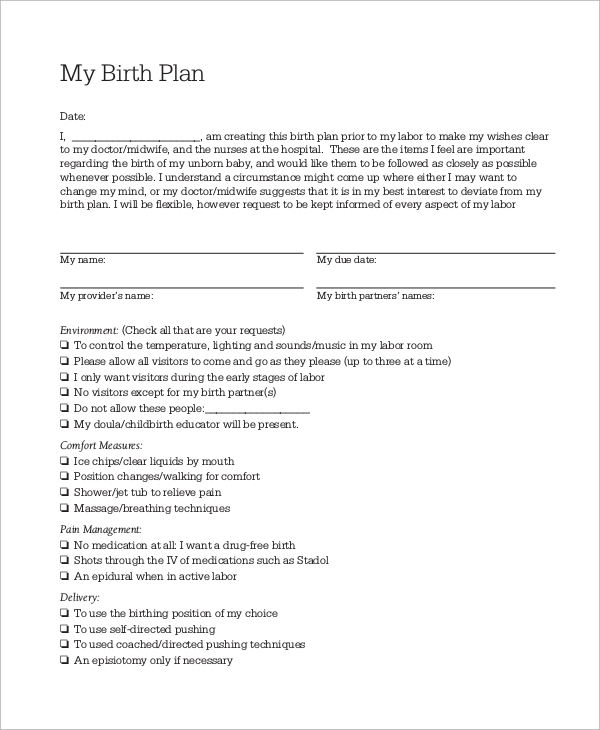 A birth plan is a plan that describes how is a baby born and by which process, in what surroundings and under which circumstances. 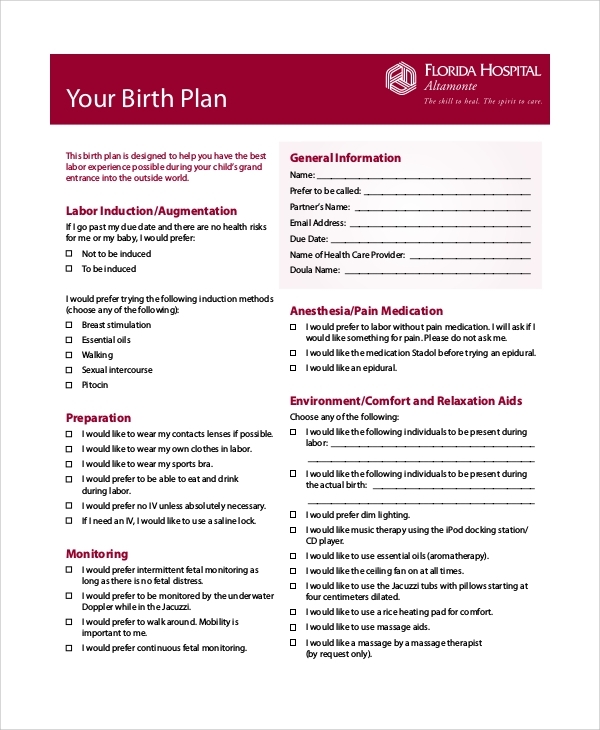 You can design your birth plan for yourself or ask your health expert to design one for you after discussing your needs and requirement during labor and delivery period. 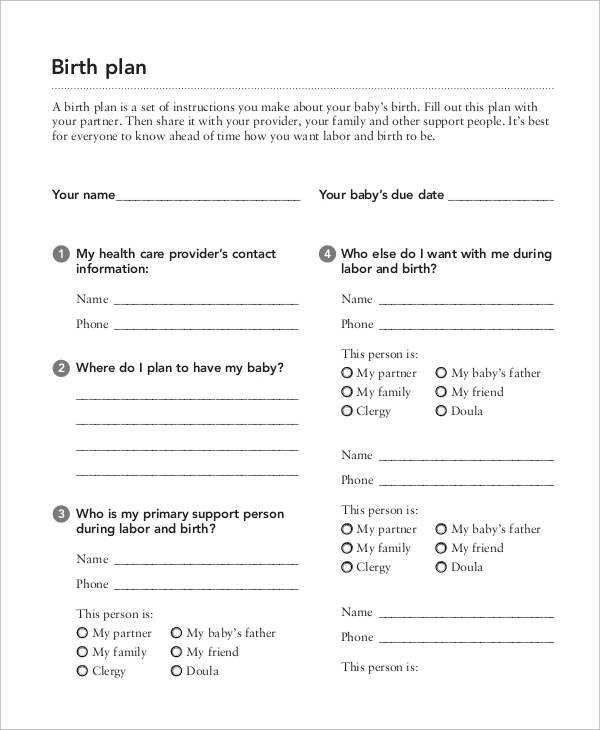 Various examples or Sample Plans are Labor birth plan, hospital birth plan, Family maternity center, baby birth pan and natural birth plans have some details about each. 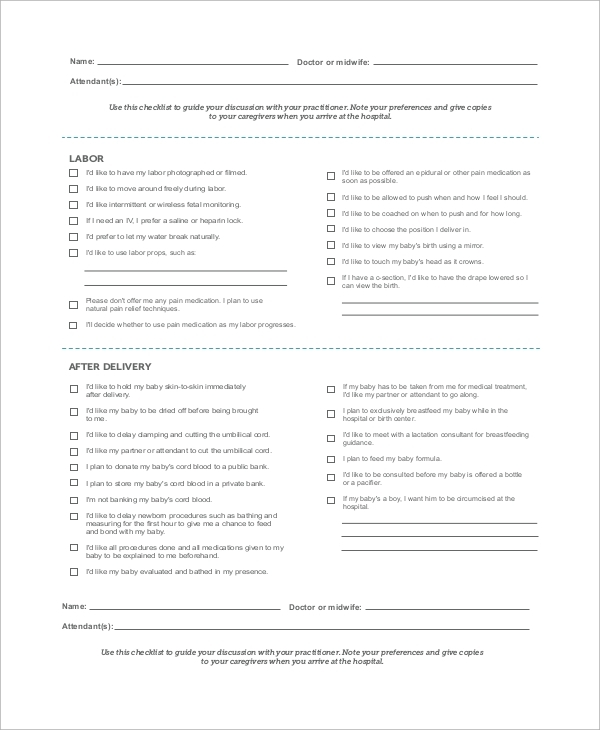 This is a plan designed keeping in mind your natural and basic needs, how you want the baby to be born, whom should be present there, the environment and whatever will make you feel relaxed and comfortable. The plan is designed while keeping the baby in mind, what all precautions can be taken, after birth where to place baby, about the umbilical cord, breastfeeding, how to plan the baby birth, each and every step is taken of care from when a baby is born, the primary doctor till medicines used. You can also see the Party Planning Samples. 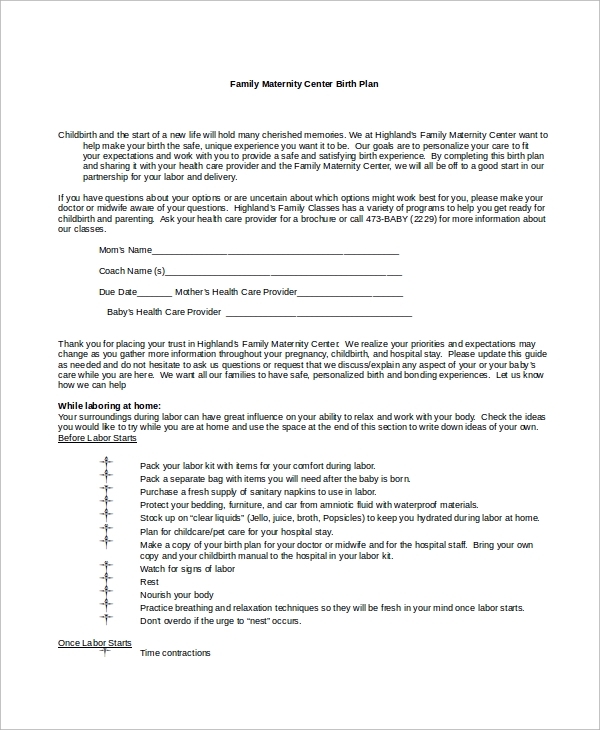 Family maternity center takes care of you right from your home until the time you will be admitted and discharged, they handle each case personally and to make you feel very comfortable in each aspect and you can choose everything from your choice. 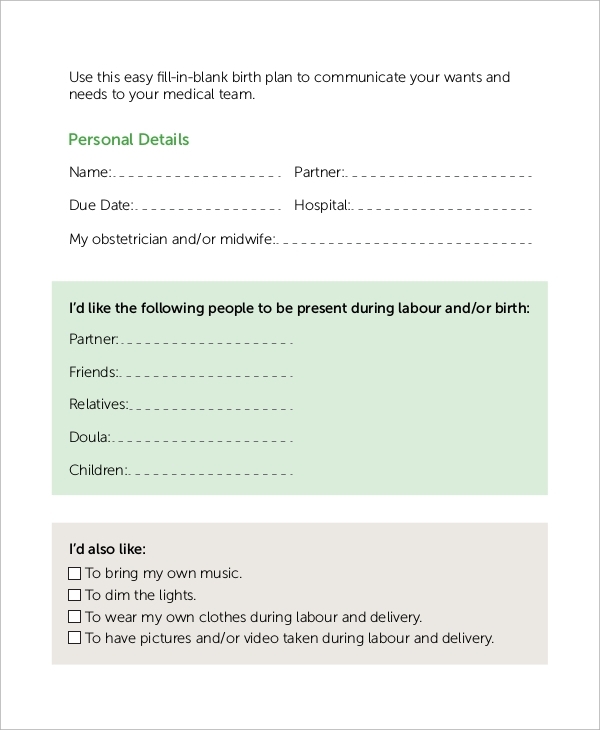 Who is the target Audience for these Birth Plan Examples? Nowadays families have become nuclear and there are very fewer people to take care of a would be a mother during pregnancy period and it is tough to handle the whole procedure alone or with your partner in such a busy schedule, especially during the first delivery. So, it is best to have expert advice and plan your Birth Plan Samples so that it will be easy during labor period and will make you less nervous and more comfortable during the delivery time under proper guidance and keeping in mind your actual preference. So it is best to opt when it is your first delivery and a nuclear family, and you want expert advice. This plan is prepared to keep in mind your needs from the hospital, how to take care of you during the whole procedure, which equipment to use, pin reliving method, entire monitoring, before and after birth measures up to feeding and even cesarean section. It is a complete care package. You can also see the Diet Plan Samples. 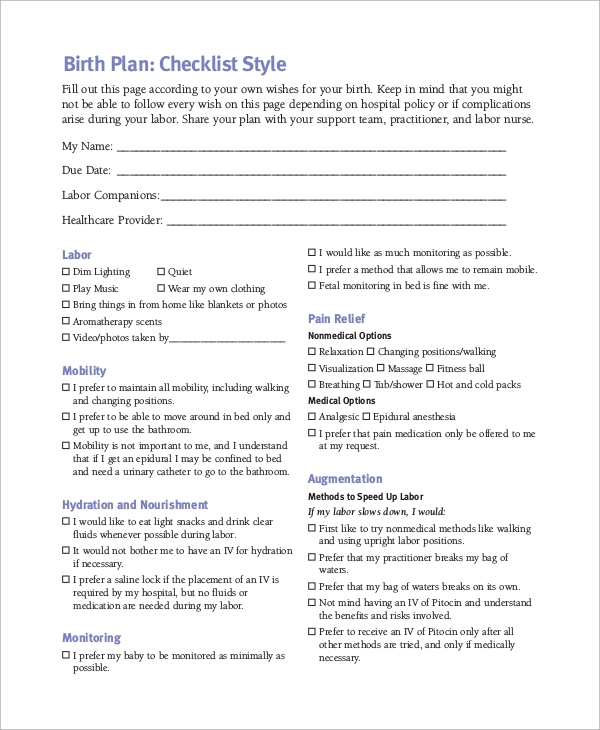 Labor birth plan is which is prepared just before the labor, or the child is going to be born. It includes what safety measures can be taken, how to do pain management and schedule delivery of the baby, how to comfort a would be mother and handle the newborn baby. 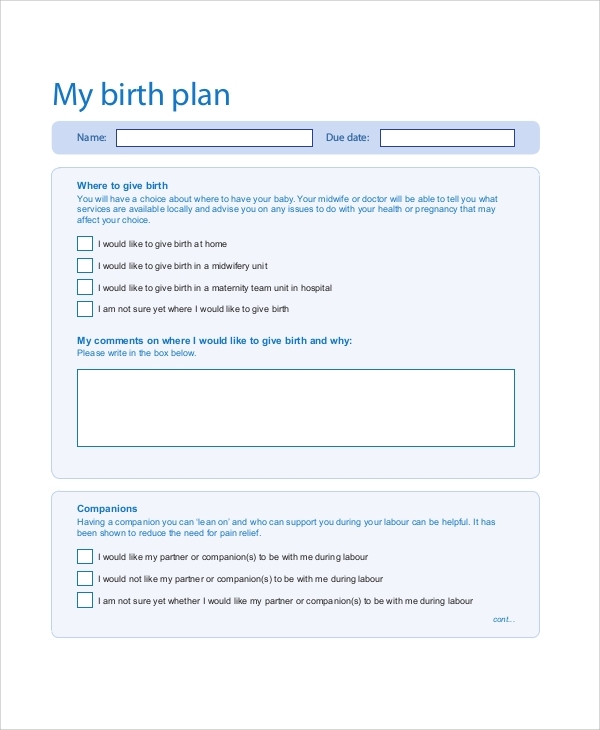 What are the Benefits of Birth Plan Examples? 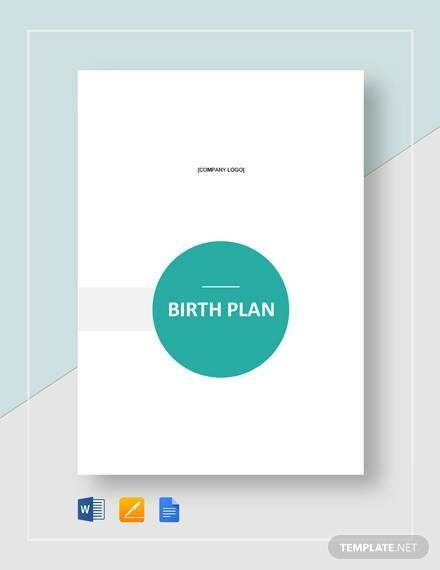 There are a lot of benefits of the birth plan; the main advantage is you can opt for a plan of your choice and need and even design it yourself. A birth plan will include all your preference and will make you feel comfortable during labor and entire pregnancy period. You will be mentally prepared for it as it is quite difficult time for women, already having a plan that too designed by you will surely give you relief and will give you and your baby a happy delivery experience. You can also see the Care Plan Samples. So, after understanding all the procedures and understanding the Sample Birth Plans, being women, you must go for it and design a plan during your pregnancy period. You need to shed all your nervousness and understand some people will take care of you, and there is nothing to worry about. 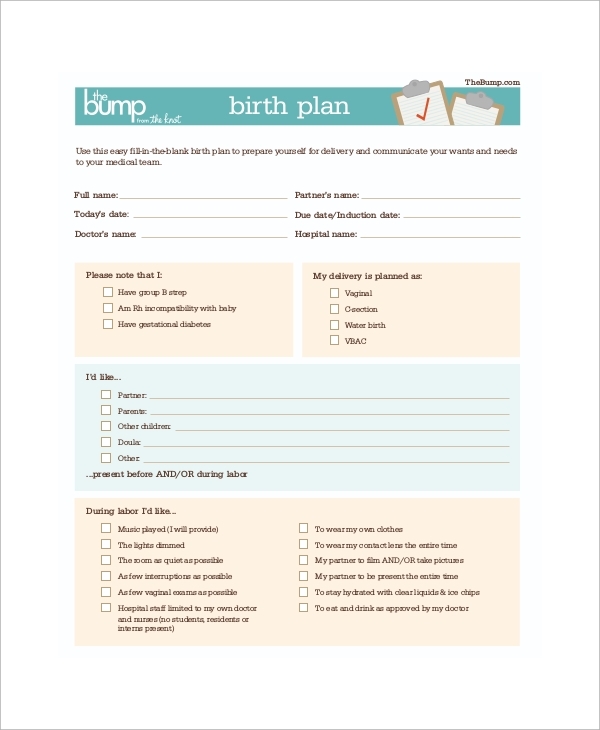 In fact, by designing a right birth plan, you can have a happy and easy delivery. Just keep in mind what you need and be clear about your requirements and then opt out for one that suits you.